This section discusses the ClusterJ API and the object model used to represent the data handled by the application. Application Programming Interface. 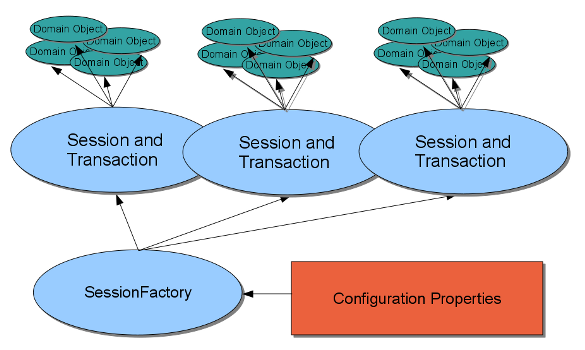 The ClusterJ API depends on 4 main interfaces: Session, SessionFactory, Transaction, and QueryBuilder. Getting the current transaction (see com.mysql.clusterj.Transaction). SessionFactory interface. Sessions are obtained from a SessionFactory, of which there is typically a single instance for each NDB Cluster that you want to access from the Java VM. SessionFactory stores configuration information about the cluster, such as the hostname and port number of the NDB Cluster management server. It also stores parameters regarding how to connect to the cluster, including connection delays and timeouts. For more information about SessionFactory and its use in a ClusterJ application, see Getting the SessionFactory and getting a Session. Transaction interface. Transactions are not managed by the Session interface; like other modern application frameworks, ClusterJ separates transaction management from other persistence methods. Transaction demarcation might be done automatically by a container or in a web server servlet filter. Removing transaction completion methods from Session facilitates this separation of concerns. The Transaction interface supports the standard begin, commit, and rollback behaviors required by a transactional database. In addition, it enables the user to mark a transaction as being rollback-only, which makes it possible for a component that is not responsible for completing a transaction to indicate that—due to an application or database error—the transaction must not be permitted to complete normally. QueryBuilder interface. The QueryBuilder interface makes it possible to construct criteria queries dynamically, using domain object model properties as query modeling elements. Comparisons between parameters and database column values can be specified, including equal, greater and less than, between, and in operations. These comparisons can be combined using methods corresponding to the Boolean operators AND, OR, and NOT. Comparison of values to NULL is also supported. Data model. ClusterJ provides access to data in NDB Cluster using domain objects, similar in many ways to the way that JPA models data. All tables map to persistent interfaces. For every NDB table in the cluster, ClusterJ uses one or more interfaces. In many cases, a single interface is used; but for cases where different columns are needed by different parts of the application, multiple interfaces can be mapped to the same table. However, the classes themselves are not persistent. Users map a subset of columns to persistent properties in interfaces. Thus, all properties map to columns; however, not all columns necessarily map to properties. All ClusterJ property names default to column names. The interface provides getter and setter methods for each property, with predictable corresponding method names. Annotations on interfaces define mappings. The SessionFactory is configured by a properties object that might have been loaded from a file or constructed dynamically by the application using some other means (see Section 4.2.2.1, “Executing ClusterJ Applications and Sessions”). The application obtains Session instances from the SessionFactory, with at most one thread working with a Session at a time. A thread can manage multiple Session instances if there is some application requirement for multiple connections to the database.